The focal point of these plated Celtic earrings is the cat eye glass stones with the Trinity knot on both sides. 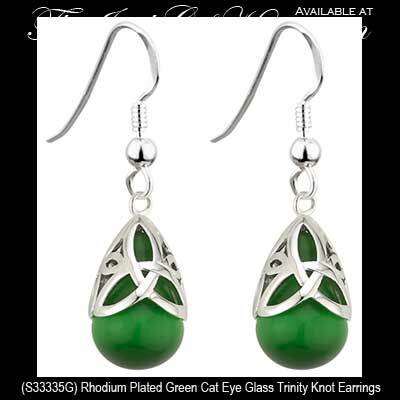 These Celtic earrings feature bulbous green cat eye glass stones that are enhanced with superimposed Trinity knots. The rhodium plated Celtic earrings are a drop style on fishhook wires and measure 1/2" wide x 1 1/2” tall, to the top of the wire.